I found myself needing to sit down a lot yesterday. But this experience also reminded me of a section in Humble Roots. In chapter 9, I tell the story of a handful of green beans carelessly tossed into a pile of dirt late one summer. A month earlier, my husband had tried to cultivate these same green beans in our garden but to no avail. He planted, he tended, he watered, he staked. But after several weeks, all he had to show for his efforts was a lush vine with no fruit. A couple of weeks later, however, my son found the bag of leftover beans and "planted" them in the dirt next to our recently constructed patio. The beans sprouted, blossomed, and produced more fruit than my husband's carefully tended ones did. The fact that success can come without our efforts is testimony, yet again, to God's surpassing power and goodness. God delights to use small, out-of-the-way, unexpected means to showcase His glory... So, what if God can grow beans in a pile of unattended dirt? What if God can bring about good things without us? What if grace is true? I never expected Humble Roots to rank so well one day after release. But I'm learning that God often does the unexpected. And sometimes the unexpected means calling us to places of leadership and influence that we did not seek. But even here, humility guides us because humility reminds us that this--all of this--was never about us in the first place. I've often seen women struggle when their influence grows--whether it's in a church, community, or even in the home. Sociologists tell us that women often lack the confidence to assume leadership; and so when they're put in places of influence, they can doubt their own abilities, withdraw, and self-sabotage. (On the other hand, men--as a general category--do not seem to struggle with confidence in their own abilities.) I know this lack of confidence to be true in my own life. When I'm put in front of people or receive public praise, all I want to do is close up shop and hide, preferring abdication over the need to meet expectations about future growth. But as much as humility reminds us that God is the one who makes our work flourish, humility also frees us to flourish in the midst of that work. 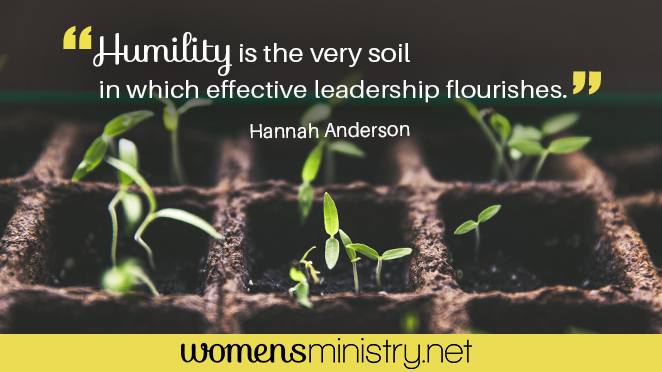 Humility frees us to become men and women of influence. 1. Humility rescues us from the need to make a name for ourselves. 2. Humility frees us from the paralysis of criticism. 3. Humility gives us the confidence to obey God's call. You can read the whole article there, but ironically enough, this was the very article that I needed to (re)read yesterday. In the midst of all the excitement and busyness of Launch Week, I'm learning to take my own medicine and remember that this isn't about me. Praise Jesus and thank heavens, none of this is about me.